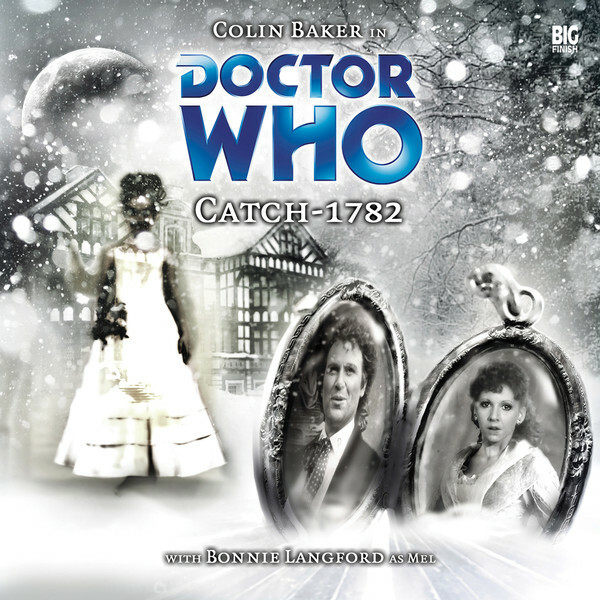 Colin Baker is the Doctor in Catch-1782. There are all kinds of complications when it comes to time-travel, often referred to as “paradoxes.” Paradoxes are defined as a statement or event that contradicts itself, yet somehow might be true. As described by Wikipedia, an “ontological paradox” is a paradox referring to scenarios whereby items, information, or actions are passed from the future to the past, which in turn become the same items, information, and actions that are subsequently passed or taken from the past to the future. This type of paradox can be seen in The Curse of Fenric, as Ace frantically sends her grandmother and the infant version of her mother, Audrey, to live in London to ensures their safety from Fenric and the crazy future-vampires attacking her and the Doctor. A “predestination paradox,” also called a causal loop, causality loop, and, less frequently, closed loop or closed time loop, is a scenario in which some earlier event #1 is the cause of (or at least one of the causes of) some later event #2, and through time travel, event #2 is also the cause of event #1. The paradox occurs when a time traveler is caught in a loop of events that “predestines” or “predates” him or her to travel back in time. In this case, event #2 would be the event of the time traveler going back in time, and #1 would be something that time traveler did in the past that in turn influenced him or her to travel back in time. In the 2007 Children in Need special Time Crash, the Fifth Doctor watches as Ten devises a solution to the collision of the two TARDIS’s before realizing that he’ll remember the solution as the Tenth Doctor because, as the Fifth Doctor, he saw Ten come up with the solution. The “grandfather paradox” is described as follows: the time traveller goes back in time and kills his grandfather before his grandfather meets his grandmother. As a result, the time traveller is never born. But, if he was never born, then he is unable to travel through time and kill his grandfather, which means the traveller would then be born after all, and so on. A variant of the grandfather paradox is the entirety of the “Bad Wolf” arc during the Ninth Doctor’s lone season. Rose sees the phrase “Bad Wolf” throughout her journeys with the Doctor, sometimes in an off-hand manner or sometimes in a more direct fashion. After absorbing the powers of the Time Vortex, she reveals that she herself used her new abilities to spread the phrase across time and space as a way to bring herself to that very moment, defeating the Daleks to end the Time War during The Parting of the Ways. Catch-1782 attempts to play around with the concept of paradox in a direct and forthright manner. Mel finds herself accidentally sent back in time to her family’s ancestral home. While the Doctor and her uncle attempt to track where and when she ended up, her distant relative has his own plans for her. Catch-1782 is an attempt to tell a different kind of time travel story, but a weak second episode is topped only be a weaker resolution, a lack of tension or suspense during its climax, and some unfortunate implications regarding the relationship between Mel and her relative. Yeah, that last sentence is just a touch creepy, isn’t it? Catch-1872 is Alison Lawson’s sole contribution to the audio side of Big Finish, having also comprised several pieces of the “Short Trips” range. Listening to this story, I got the impression that Lawson was striving for a Jane Austen type of story – aristocrats, servants, damsels in distress, love shining through, and witty, snappy dialogue. The first episode of Catch-1782 has its moments, especially the chemistry and banter between the Doctor, Mel, and her uncle John. The Doctor and John have their share of moments throughout their time together, as John attempts to balance the wonders and terrors of time travel with the realities of who will take care of his cat, Jupiter, while he’s gone (in an example of where this serial stumbles, Jupiter has his share of memorable moments with the Doctor). Sadly, after the gripping climax to the first story, with an exploding TARDIS and Mel being thrown through time, the story grinds to a halt. The first speedbump comes with the characterization of Melanie Bush, or as she slurs during her confusion, “Nel,” the name she’ll come to be known by in 1781. Lawson attempts to give Bonnie Langford some dramatic dialogue to work with after a light hearted first episode, but instead of slowly pulling the listener with growing confusion and terrifying realization, Mel in the second episode comes as close as she ever has to being the “shrieking violet” television viewers remember. She spends the second episode in a confused stupor, repeated the same lines and phrases over and over again, first to Henry Hallam and then to his friend, Doctor Michael Wallace, doing so in a louder and more panicked voice each time. It’s not subtle, it’s not even a sledgehammer, its just a case of yelling to convey emotion. She then spends the third episode in a laudanum-drugged stupor begging for the Doctor to rescue her and the fourth episode simply blowing the proverbial popsicle stand and going home. I don’t blame Langford for this, as she tries to do her best with the material, but the direction (Gary Russell…once again) isn’t there, and apparently neither was a script editor. Between this and the mess that was the previous serial, Dreamtime, I’m wondering if the script editor called in sick for two or three weeks during production and recording! What the Minuet in Hell?!? Add to it a few mentions of Hallam watching Mel while she sleeps and the whole concept of Hallam and Mel/Nel is just inappropriate for this story. For this aspect of the story to work, Mel shouldn’t have been drugged and kept captive for six months (and poor Mel, first three months next to Davros in The Juggernauts and six month of this? ), but rather become a part of Hallam’s house, a close friend that he can’t bear to lose when it’s time for her to leave. It would have better served the story AND both actors. It’s a Big Finish story, and for half of his time, Colin Baker does his usual best to sparkle, mainly when he’s with Mel or interacting in the 21st century with the members of the institute and Mel’s uncle. It’s a shame that Baker and Langford didn’t have more time together on television as their partnership truly works, both when they’re needling each other (“you’re going to wear THAT to a black tie affair?” “…yes?”) and when the Doctor is apologizing to Mel for not coming to her rescue sooner. Baker’s time with John Hallam (long time veteran actor Derek Benfield) is a delight, as Hallam realizes early on just how mad the Doctor is and how insane time travel is, and that this insane madman is the only hope for getting his daughter back. This isn’t a man going “wow, time travel is so cool,” this is a man going “time travel is flat out bananas!” But he and the Doctor do make a good investigative team…and it’s funny that Colin Baker, as mentioned earlier, gets in a few choice lines regarding the care and feeding of John’s cat, Juipter! Synopsis – Boring and without tension, Catch-1782 wastes the opportunities that a time paradox can bring for bland performances and some creepy subtext. 2/5. Peter Davison is the Doctor in…Three’s a Crowd. This entry was posted in Big Finish Review and tagged 2/5, Big Finish, Bonnie Langford, Colin Baker, Doctor Who, Doctor Who Audio, Doctor Who Review, Mel, Sixth Doctor, TARDIS. Bookmark the permalink.